A major substance on the market for non-surgical facial rejuvenation is botulinum toxin (Botox). This cosmetic procedure has been rewarding for thousands of patients who have found their appearance vastly improved by Botox injections. The procedure must be performed by a skilled, certified physician who specializes in cosmetic surgery and has prior experience with injecting the Botox treatments. 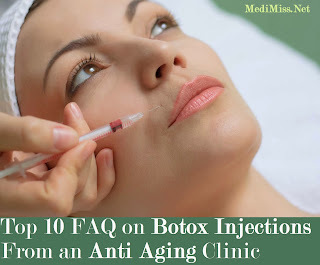 Following are ten frequently asked questions about Botox injections from an anti-aging clinic. Botox injections are very safe when being performed by an experienced cosmetic specialist and is the most common cosmetic procedure in the United States. It is FDA-approved to treat lines, wrinkles, and excessive sweating. Some common side effects that may be experienced by patients are swelling or bruising at the point of injection or flu-like symptoms and headaches. Patients should select experienced cosmetic specialists as the correct placement of injections is critical. Misplaced injections allow Botox to spread to nearby tissues causing the following complications: droopy eyelids, misaligned eyebrows, lopsided smile, dry eyes or extreme tearing. 2. Are Botox Injections Painful? 3. How long does a Botox Treatment Take? Botox injections take only a few minutes. The entire procedure may last up to twenty minutes depending on the number of injections sites needed to receive treatment. 4. What is the Recuperation Period? Most patients are able to get Botox injections and immediately return to their normal activities. 5. How Does Botox Work? Botox injections use botulinum toxin to paralyze facial muscle activity for a period of time. The injections block specific chemical signals from the facial nerves that cause muscles to contract which trigger wrinkles, including: frown lines occurring between eyebrows, crow's-feet, and forehead wrinkles. 6. How Long Does it Take to Notice Treatment Effects? The procedure usually takes five to seven days for maximum effects although some patients report results in as little as one or two days. If no results are observable after seven days, antibodies may be blocking the Botox and additional Botox units may be needed. 7. How Long Do Botox Treatments Last? Different factors determine how long a Botox treatment will last. If more Botox units are used, the results will last longer. Generally, treatments last from two to six months but most people experience three to four months of diminished wrinkles. 8. How Often Will I Need to get Botox Injections? To maintain Botox effects, patients need to receive follow-up injections on a regular basis. With continuing treatments, most patients can maintain treatment effects by receiving injections every four, five, or six months. 9. 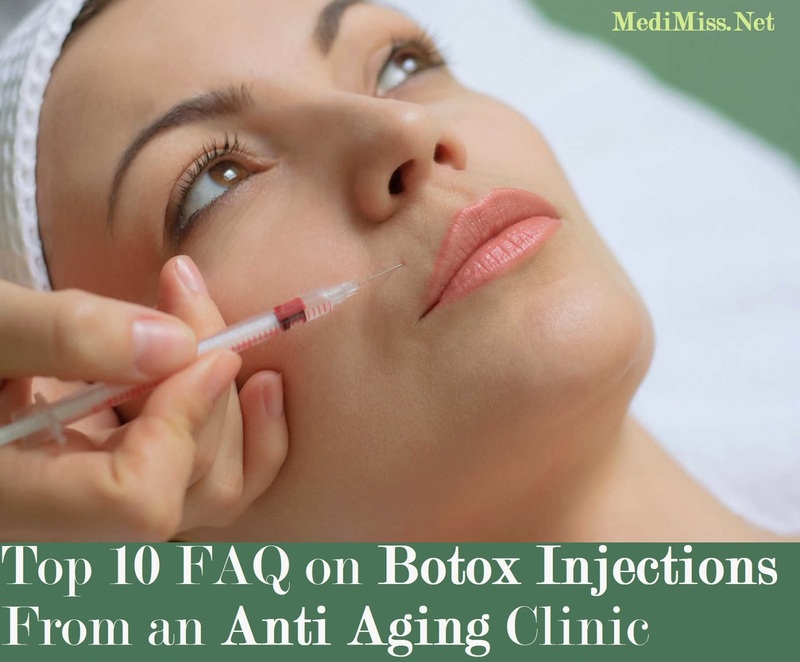 What is the Success Rate for Botox? Botox success rate is 8.3 out of 10 or 83% worldwide. Patients that don't have successful experiences may have received the wrong dosage, had unrealistic expectations, or injections that were incorrectly placed. 3% of the failures are thought to have difficulties with antibodies that interfere with the Botox effectiveness. 10. What are the Risks? Like all medications, Botox may cause allergic reactions in some patients. In some rare instances, botulinum toxin spread to other parts of the body and caused botulism-like symptoms. Most physicians will not use Botox when a woman is pregnant or breast-feeding.